Normally while I take my shower every morning, all I’ve got to gaze at, when I’m not getting soap in my eyes, is a bland white wall. 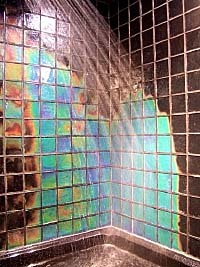 Things could be so very different though if I remodeled and installed these very cool color changing tiles. Made of glass, they react to changes in temperature, acting sort of like a mood ring for your daily wash-up. The tiles look black when the surface is at room temperature, but turn on the hot water and the black begins to disappear and be replaced by blues and greens and aquas. Moving Colors, the company that sells these, says the color scheme was inspired by the “Northern Lights” in Alaska. They have other styles called “Tie-Dye”, “Watercolors” and “Liquid”. Each name pretty well captures the color transitions that correspond with the actual tile, and not all the tiles start out as black in hue at room temperature. I can add this rainbow shower blast to the new colored toilet paper I’m planning on buying. My rubber ducky is suddenly quacking for a room make-over.